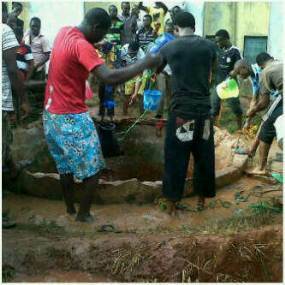 This morning at the Ambrose Ali University, Ekpoma, tragedy stuck when seven female students fell into a well located inside a hostel in the school compound. Eye witnesses claim, three of the girls were washing on top of the well, while the remaining four were sitting on its top, when all of a sudden the well collapsed beneath them. All seven girls fell into the well. Other students around the hostel when the incident occurred rescued 6 of the alive. Unfortunately one died inside the well. Another one died on the way to the hospital. The remaining five are receiving treatment at the hospital.